This is my third post in a series about Christians of different Myers-Briggs types. When you start talking with people in the churches, it quickly becomes clear that while we share a common faith there is quite a variety among us as well. Some of that has to do with background, some with the denomination we’re part (or not part) of, and some with personality. And if we want our churches to be a welcoming place for all people who seek to know Jesus, it’s a good idea for us to understand how different personality types relate to their faith. Our walks with God don’t all look the same. We’re influenced by our backgrounds, variations in beliefs, and individual personalities. And even though the goal is for us all to become “like God,” that doesn’t mean we become indistinguishable from each other. God created great variety in people and I believe He did that for a reason. So let’s spend today’s post hearing from and talking about the unique perspectives of INFP Christians. I heard from five INFPs who responded to most of the questions I asked. In general, INFPs are private people and I’m not surprised that the response rate was lower than what I saw for the INFJ post and the ENFP post I wrote earlier. One INFP who I talked with in-person said she wouldn’t feel comfortable submitting even an anonymous response. Still, I hope any INFP Christians reading this post will feel safe commenting and adding their thoughts to the conversation. I’d love to hear from more of you! 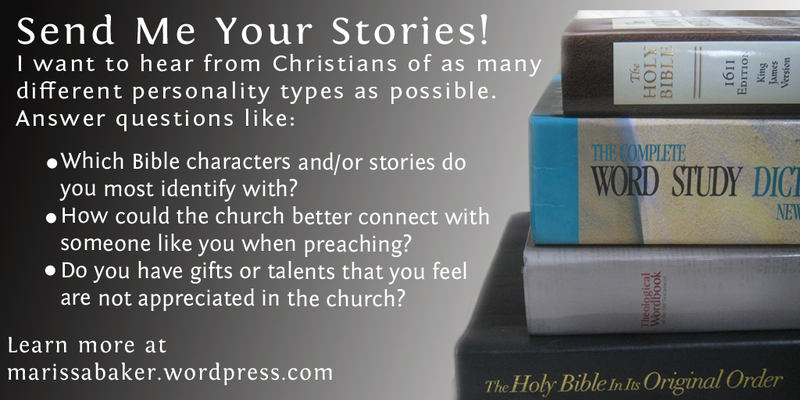 The first question I asked people was which Bible stories and characters they identified with most. There was very little overlap in specific characters INFPs chose as their favorites, though several of the chosen characters were prophets. Brian writes, “I love Enoch and Elijah because I am always baffled by the fact that they were taken up and allowing them to avoid death. I always ask myself. What did they do that God just wanted them. I know we an read more on Elijah than Enoch but these two are very interesting to me. I can’t say I really have a favorite. I find interest in a few that aren’t really talked about. Lazarus being one of them. How deep was his relationship with Jesus. Jeremiah. How did he endure all those years telling Israel to turn from their ways. On the whole, INFPs don’t seem quite as worried about finding their particular niche in the church as other types I’ve talked with do. I wonder if this has to do with the fact that Introverted Feeling is their “driver” process. Also called “Authenticity,” this mental process is more concerned with staying true to one’s own convictions than meeting outside expectations. Perhaps if INFPs believe they understand how they best fit into Christ’s body they don’t feel so much pressure to discover how others think they’re “supposed” to fit in. Two INFPs mentioned that the expectation to be “outgoing and socially active” is draining for introverts. But by and large, the INFPs I talked with didn’t have complains about the church not being a good fit for them. 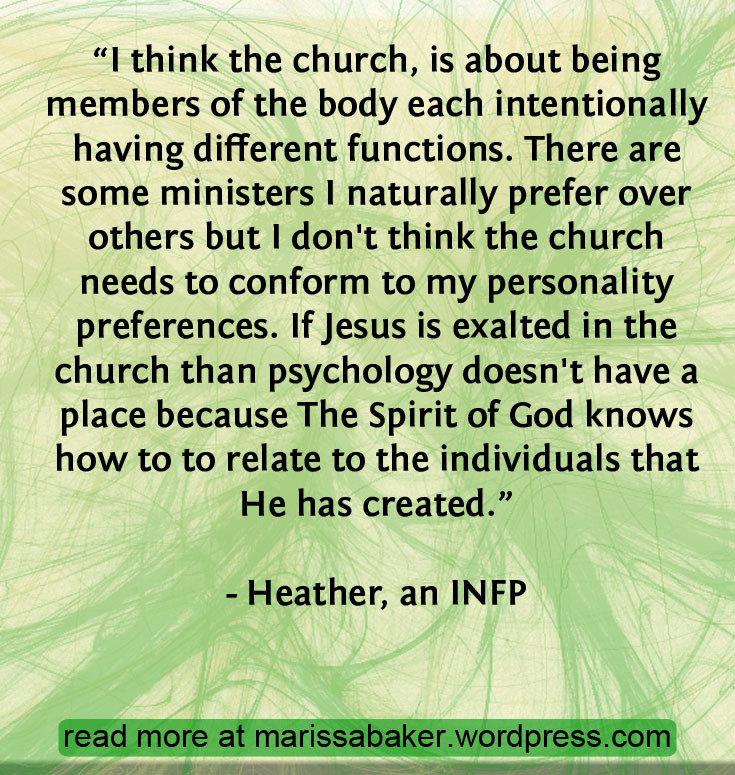 In fact, Heather wrote, “I think the church, is about being members of the body each intentionally having different functions. … I don’t think the church needs to conform to my personality preferences.” This is a common theme among INFPs. They don’t feel that it’s the church’s responsibility to “make room” for them. That’s why I chose Ephesians 4:16 as the title scripture for this post. INFPs truly believe that the church needs every member and they seek to find their authentic role as one member of Christ’s body. When asked how the church could better connect with someone like you when preaching the gospel, Boniface wrote, “Not sure. I think it does a pretty good job already.” Patricia elaborated, saying, “I don’t think that the church needs to make an effort to connect with me, but that is my personal responsibility as a Christian to make an effort to connect with the church, imperfect and diverse as it is.” Wow. If more of us had that attitude, I doubt we’d have so many people feeling alone in their churches. As for connecting with non-believers, Patricia writes, “I think that this is the strength of having diverse church members who can, in their own way, share God’s love with others.” I’ll whole-heartedly second that opinion. It’s one of the reasons I started this series — to help draw attention to how good it can be to have a personality-diverse church where everyone’s unique gifts are appreciated. 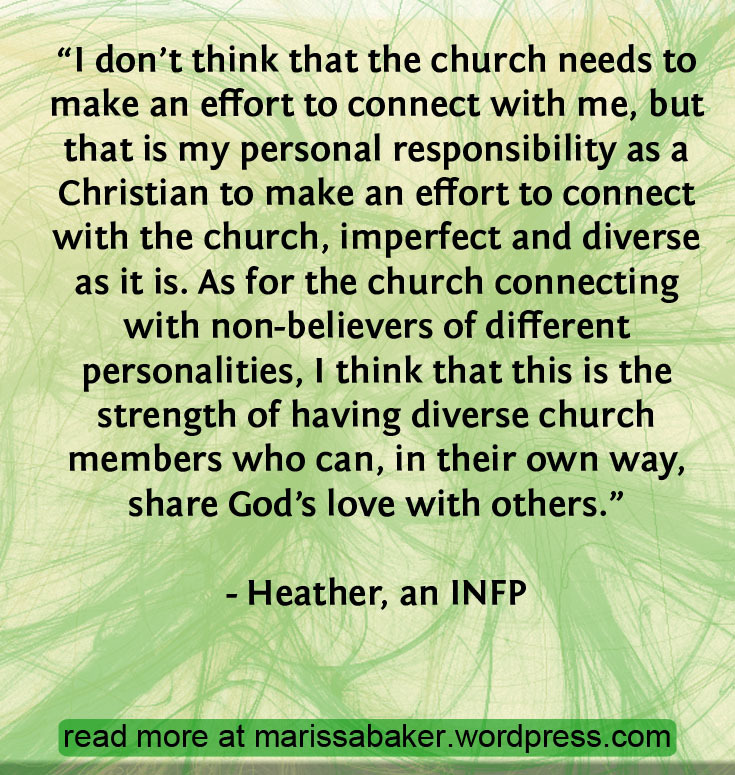 Just because INFPs feel it’s their responsibility to connect with the church doesn’t mean the church shouldn’t also work on making itself a welcoming place for INFPs. God has created great variety in people and encourages a diversity of gifts and talents in the church, so we should as well. Boniface specifically mentioned that “aggressive, in-your-face preaching” is not a good way to reach INFPs. 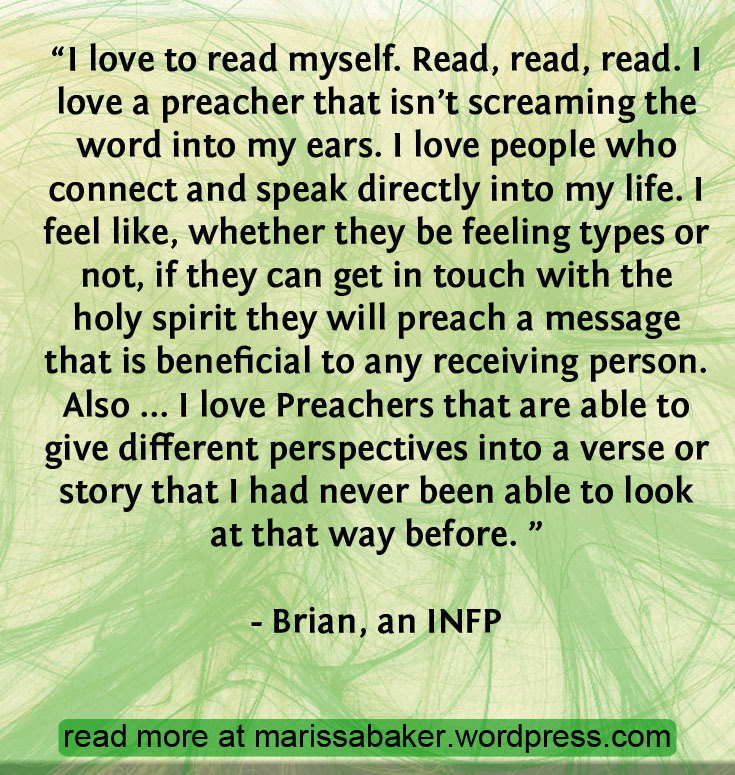 Brian also said, “I love a preacher that isn’t screaming the word into my ears,” but added “I think as long as the preacher is anointed by the spirit, the spirit will call my spirit.” INFPs tend to have preferences for a certain type of church service, but they’re also open to learning from any teacher who seems to be sincerely following God. Everyone who’s a Christian faces challenges as they try to follow Jesus. Only four INFPs responded to this question so I hesitate to make any broad generalizations for the whole personality type. However, three of those four mentioned some kind of disconnect from God as a struggle (the fourth mentioned socialization with people in their age group, a fairly common challenge for introverts like us). Boniface writes that “being faithful” is his biggest challenge as a Christian. Patricia says, “When I go through bouts of depression in response to stress in my life, I lose sight of who God is (God’s continual provision for me, and the hope that He gives me simply from being present). I do not become angry at Him, or unaware of His presence, but I become distracted and confused in my own negative feelings.” And Brian mentioned that he deeply identifies with Paul’s struggle in Romans 7:15-20. Brian also added another challenge, saying he has difficulty spontaneously talking with someone about the gospel. He writes, “I would love to tell everyone but don’t want to seem like I’m forcing anything down. I respect people and their current beliefs, but I feel like the times we are in today don’t allow for much growing in what is correct. It’s more of a ‘live, and let live’ sort of moto for the world now and no one really wants to be told they’re wrong.” That’s something I’ve struggled with, too — finding the confidence to stand up for your belief in God’s truth in a way that connects with people rather than driving them away. Patricia: I think that there are many factors affecting my growth as a Christian (supportive parents, Christian friends, living in a country with freedom of religious expression), but as for why I am one in the first place – it is hard for me to say. I can relive the events almost a decade ago that lead to me praying for God to be a part of my life, and the resolve I felt afterwards to commit myself to him, but that circumstance then was not the reason why I am a Christian today (in a similar way in which simply being born into a culturally Christian family does not make an individual child a Christian). A Christian is someone who has the Holy Spirit living inside of them and working in their lives. I know that I am one (perhaps intuitively), and maybe a sensor or thinker could point how it plays out in my life tangibly, but I don’t pay attention to that. I just trust in God’s sovereignty, and carry on with my life, with hope that He knows best for me, and thankfulness that He is a part of my life. Dara: Science. Everything points to creation, despite what the world says. Furthermore, I’ve met God, and he’s met me in my darkest moments. Brian: I was just listening to a teaching on this today actually. I agreed with all of it. I cannot NOT believe after what I have been taught and read myself. After questioning and doubting God and God revealing himself to me in many ways. I love him because he first chose me, and if he first chose me then what “choice” do I have against that. Simply, I believe, because he has called me to believe. Boniface: History of the Church and its survival and growth in every century. Despite every human weakness and sin. My own experience of encountering good Christians, and through them coming to know the Lord. Your turn! If you want to share your Christian INFP story or talk about INFPs in the churches, comment here! And if you’re a different personality type looking to contribute an upcoming blog post in this series contact me or head over to the original post. I’d love to feature you! Please note: unless you tell me otherwise, I’ll assume that by getting in touch you agree I can quote you directly and credit you by first name (or screen name) and Myers-Briggs type in future projects. ← Which Criminal Are You? Thanks for commenting 🙂 I’m glad you liked it! Loved this, I’m an INFP & love Jesus, but definitely relate to Romans 7 too; it’s so hard to look at Christ’s light when you’re too busy wrapped in your own darkness. ❤ thanks for writing! Glad you like the post 🙂 Thanks for commenting! Hi, I’m an INFP and grateful to be asked those questions:). The beatitudes resonate with me, and the way Jesus honored the poor. I relate a bit to KingSaul of the old testament, the way he hid rather than jumping at the chance to be king initially. And his weakness of people-pleasing, and jealousy. And I most admire the characters who had no fear of what people thought like King David and of course Jesus. Preaching that resonates with me is more to do with the preacher himself – that the preaching comes out of their life lived radically obedient to Jesus. I also love straight direct truth that cuts to the heart, mixed with words that build up. I struggle to respond to “you should be doing this because its your duty” and respond well to “You can and will do this because its who you are in Christ”. In regards to INFP giftings, we have quietly strong values and passion to help people which stimulate out of the box ideas for the church, that with some adjustment by a more practically minded person could really great if implemented, but some INFPS may struggle to express ourselves or make our voice heard. For me I end up praying God will give the ideas to a stronger personality. Churches could benefit from asking infps for ideas God has given them for how the church could help people in need. I bet they will be surprised to see the quiet INFP come to life. Thank you so much for commenting, Holly! I’m sorry to hear that 😦 Connecting with people is hard enough for introverts without something like an illness to make things even harder. It’s wonderful, though, that God gave you a prayer ministry to still make a difference in His people’s lives. Blessings! INFP Christian here! I became a Christian 1.5 years ago because I am a seeker of truth and eventually always follow the direction my gut/heart pushes me in (it may take me a long time to act on a directive, but I eventually do – especially when my life starts to feel inauthentic/stagnant). As I mature to trust the intuition and the way that I specifically connect with God I am learning to move a little faster. Praise the Lord! I think it’s called becoming “sanctified”, or “spiritually mature”. Spiritual maturity has to do with learning the way God molds your piece of Clay, and allowing Him to continue in His work in you. Also…It is imperative as an INFP to not allow people to take advantage of them. INFPs love to give but God did not create anyone to be a doormat. He created us to receive as well as give. INFPs challenge is to cut out energy-suckers from their life and find people who appreciate their authentic intensity (it’s rare to find people who can handle the uniqueness of an INFP). INFPs are most likely to be pop-stars or unique artists, people tend to appreciate them from afar, giving them great admiration but intimacy is harder to find for an INFP because people need to get the stars out of their eyes and see that the INFP is human and has needs too. INFPs can confuse introversion with social anxiety. Social anxiety is not introversion. Social anxiety might come from childhood trauma to the sensitive and often misunderstood children who are INFPs. INFPs (as probably all MBTI types) do best when they seek out mentors hip from wise counselors. They need people who can genuinely see them. INFP easily get hurt emotionally so it is imperative to surround yourself with people who are for you, not against you. Even ambivalent friendships will drain the INFP (secret back-stabbers). As a Christian my INFP gift is to listen to the depths of someone’s soul. INFPs can make someone feel heard and valued. They are a quiet force in a group but a force indeed. Their quietness can actually intimidate some people and people-pleasers may try to crack the INFPs “code”, which is confusing because they just don’t get the INFP and can’t handle being close to the authenticity of an INFP. This is why INFPs can only thrive when they allow authentic people into their intimate space. Introverts don’t take draining people very well. Boundaries are essential. I could go on and on. The journey of discovering the uniqueness in which God makes each and every person is a wonderful part of life. Helping others understand their own personality/uniqueness is also a gift to be shared. Thanks for commenting 🙂 I love this: “Spiritual maturity has to do with learning the way God molds your piece of Clay, and allowing Him to continue in His work in you.” What a beautiful definition! This is a great topic, thank you. I have pondered many of the same questions and reflections of the people who were interviewed for this piece. I really resonated with Brian when he said “I love him because he first chose me, and if he first chose me then what choice do I have against that. Simply, I believe, because he has called me to believe.” Beautiful. I do care about sisters in Christ and non-believer friends, but it drains me to spend time with them, especially in group setting. (Small group? Women’s retreat? No thanks…I’d rather spend time with Jesus alone) It’s hard to do ministry with those who are pushy and demanding, because of course we’re introverts who express our thoughts better in writing than in person. I get hurt easily from people who call themselves Christians but are plain insensitive and rude. I can love them from afar but don’t like them tbh. I resonate with John (the writer of Revelations and Gospel of John) and the gospel of John because he was an INFP himself. So poetic and so powerful. Hi Emmy! Thanks for commenting and sharing your thoughts on being an INFP Christian 🙂 I agree with you about loving John’s writing style. And I know what you mean about getting distracted, even though I’m an INFJ. I had to establish a Bible study routine in the mornings, too, otherwise I’d forget or keep pushing it off until night when I was too tired to focus. Hi I am an INFP Christian, raised in the faith, however not until later, through many struggles, did I connect with God in a personal way; looking to seek Him through prayer, the word, worship and His creation. While I am INFP I have moments where I seem quite extrovert, and in a church I tend to find I spontaneously serve as the Spirit leads, often through one-on-one or small group deep and meaningful relationships. I often find it difficult when other Christians have expectations on what others relationship with God should look like. We are all different, our personalities and experiences make us unique in how we relate to people and to God. I agree I dislike prescribed aggressive preaching, I would rather hear something personal about how this lesson effects the preacher, showing humility and the workings of God through their lives. However, it is my responsibility to gain perspective through the holy spirit on the teachings being taught, no matter the pastor. If I come away feeling unsatisfied then its me who needs to pray and reflect, as the Lord will share what he wants to know. I often am blessed in words of knowledge (1 Corinthians 12; 8) in the more creative form of metaphor and similes, which reflect the Word, but often give individuals hope in whatever crisis they are in. This can lead to further teaching, healing and hope for the individual. I find it amazing how God can work through me in this way, it can be someone I have known for a long time or someone I have just met asking for general intercession. I agree that the greatest hardship I have endured have been while not actively or even drifting from God and relationship with Him, often leaving me feeling stressed, depressed, anxious and down trodden. When finding a role with in the church, I find as an INFP, that having a specific role is almost too structured and limiting to the act the Spirit can move in us if only we were flexible and available to act. However, due to hierarchical and leadership roles within church, I find if you do not step up and serve in the prescribed ways then you will not earn the respected required to be listened to when the Lord does have something to say through you. It is a hard balance. Thanks for commenting! 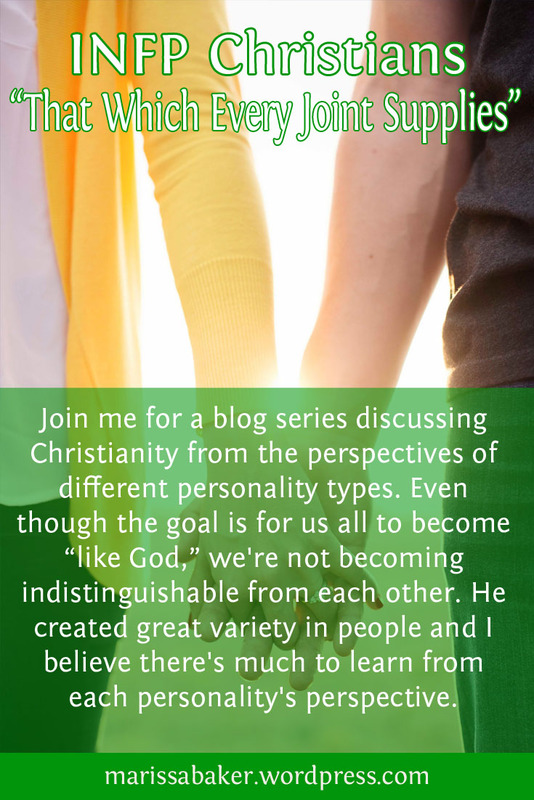 I agree it’s difficult “when other Christians have expectations on what others relationship with God should look like.” I’m hoping my posts in this series are helping show how our unique personalities influence the ways we relate to others and God and that we shouldn’t expect everyone to be the same. Even within personality types there’s almost as many differences are there are overlaps between the people I talk with. And I think that’s great! Being an INFP made it easy for me to see God’s glory in everything. I mean back then I was fascinated with a lot of things such as books, movies, anime, concerts, songs, etc. But when I come to the saving knowledge of Jesus, all those things made more sense. Like you will literally connect and draw the truth of God’s word in all those things and experiences. The endless wonder of seeing His glory in everything and being able to see things redemptively. I also become more rooted on what is most important, Loving God with all my heart, soul, mind and strength and loving my neighbor as myself. Identity and Sonship is something God has been thoroughly stamping in me, that my confidence and worth is in Him and His finished work in Christ. I resonate more with John and his writings especially on John 15 Abide in Me and Paul’s latter verses in 1 Corinthians 13 where now we see but a poor reflection in a mirror but we will know fully just as we are fully known. I remember crying on Jesus’ reinstating Peter on John 21. The heart wrenching portrayal of Hosea of God’s relentless love to His people and the zealous devotion of Jeremiah, the weeping prophet. I also love reading Bible in many different translations. Hello everyone! 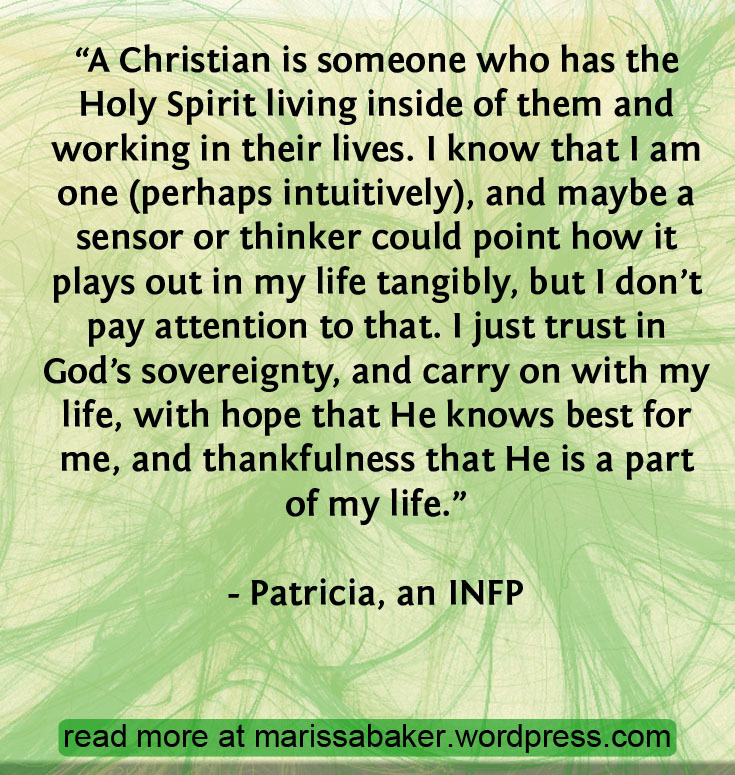 I sure am glad to find someone cross referencing Christianity and the personality type I identify with, the INFP. I wanna tell y’all what happened to me in 2011 but it’s a long story so I’ll tell you the best part. I was following God the very best I knew how, even being careful to think on good, honorable, just things. I was going online and trying to help the lost people commenting on yt videos. One day it seemed I was seeing God speak to me through coincidences too many to be just coincidence, so I asked the Lord, what are you showing me. At this time in my life I prayed all day to the Lord! So this time he actually responded!! So I heard his voice! It’s very deep like in the movies!! I won’t tell you what he said because it causes more questions and it’s hard for people to believe, but I want you to know that God IS listening, and he sees you and knows everything you think so clean up that mind and talk to him always! Keep your focus on him even as you do your daily work. God bless!! Hey, I’m a teenage INFP Christian and I’m serious about my faith. I want to share the good news of Christ to my peers and atheist classmates, but I’m nervous. I have let them know that I’m a Christian, but I find it hard to own and really be proud of it. Any suggested verses or prayers? I love reading the Psalms when I’m nervous about something. There are so many examples of David and other Psalmists turning to God and expressing their need for and trust in God’s deliverance because they’re surrounded by people and situations that scare them. Psalms 56 and 91 come to mind, and I know those aren’t the only ones. I also find Psalm 139 very encouraging because it reminds me that God is constantly watching out for us and that He can step-in if we get in over our heads. Also, you’re not alone in being nervous about sharing the gospel with people. It’s something that many introverted Christians struggle with. I’m not saying we should use our introversion as an excuse to not share the good news of Christ, but I do think it’s okay to share in an introverted way. That might mean getting to know your classmates before talking more about your faith, and then sharing in a one-on-one setting rather than to an entire table of people at lunch. Or it might mean just living out your faith and being ready to answer questions when people ask why you’re doing things differently than non-Christians. “Be strong and courageous. Don’t be afraid or scared of them; for Yahweh your God himself is who goes with you. He will not fail you nor forsake you” (Deut 31:6, WEB). Hi, I’m an infp. Pastor/missionary parents. Been in church fifty three years but no longer. Married to entj with same background. Raised to submit, comply, serve and count my blessings. Have taught Children’s church most of my life and adult women’s bible study. Love counselling and encouraging one on one, love theology, parenting, art, poetry and writing. Enjoy hosting meals – keeping a low profile whilst others are more extroverted. Always feel that most people don’t feel entirely comfortable around me . One friend told me she was slightly scared of me – it was the inner sight and the laser beam passion that sometimes breaks out. I’m like one of the rarest books in a library that most people don’t seek out but I’m also an open book for whomever finds me and values me. I identify with Mary, the mother of Jesus. Eg. ‘She pondered these things in her heart’, she wrote poetry/song, she noticed when the wedding hosts at Cana needed help and she got onto it, she was doggedly faithful but not boastful. She seemed modest. My entj husband loves the fact that I am perfectly capable of standing up to him toe to toe. Speaking truth to power. Most people find him terrifying. I don’t. He likes that I have a detachment to my emotions and can communicate my emotions logically. I can see links everywhere when I’m reading scripture so it feels like fresh insights/god speaking to me. My husband and I have finally left the church because at this time in its history it doesn’t seem to reflect the counter cultural message of Jesus nor the faith I grew up with. It’s become political and commercial, prideful and hateful. I feel as though I’ve been living in a closed kingdom like North Korea where we have been told what we’re allowed to think. We cannot keep God to ourselves nor confine Him in a cage (temple). I’ve fought for years in the cause of the church but my convictions and my sense of truth has led me out. I believe that God wants to lead us onwards into new places and out of our comfort zones. Oh dear,…now I’m starting to rant – which is a very infp thing to do. Sorry. Thanks for this interesting series on my 2 favorite interests: Christ and understanding how to grow, integrate, and develop the Body of Christ (especially using MBTI). God has placed me (an INFP) in 2 churches under STJ senior pastors who create a very STJ-friendly environment within the church walls…within a geographical area that has an INFP vibe. So these church members are literally un-equipped in witnessing to unchurched locals about Jesus if they follow the senior pastors’ way. Therefore, to ace their discipleship tests, they must give up their way, pick up their cross, and follow Jesus in doing the opposite of their will to appreciate/adopt “my” style more to attract these people to Jesus. Cue church battles. I relate to almost every major and minor Biblical “character” because I go through all of their experiences in some way as I study the Bible. Since 2014, God has called me almost all of the prophets at some point. He started by saying that I am John the Baptist. Then I experienced all of the Biblical women’s trials as I read “She Speaks: Wisdom from the Biblical Women to the Modern Black Woman”. 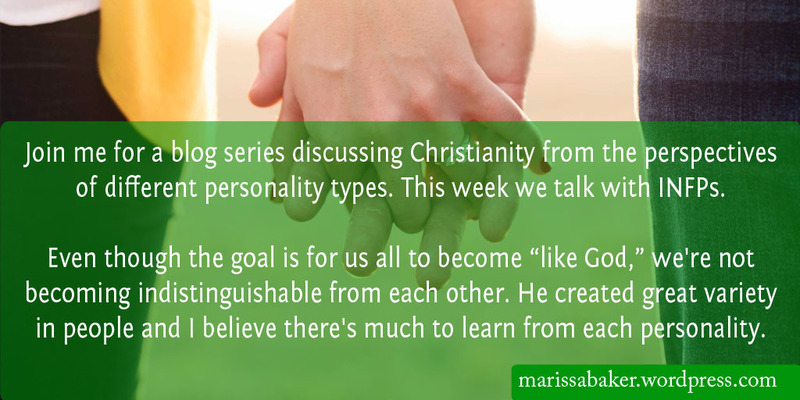 Thanks, Marissa, for this series on Christians and personality type. I’m interested in using the MBTI to grow, integrate, and develop the Body of Christ.